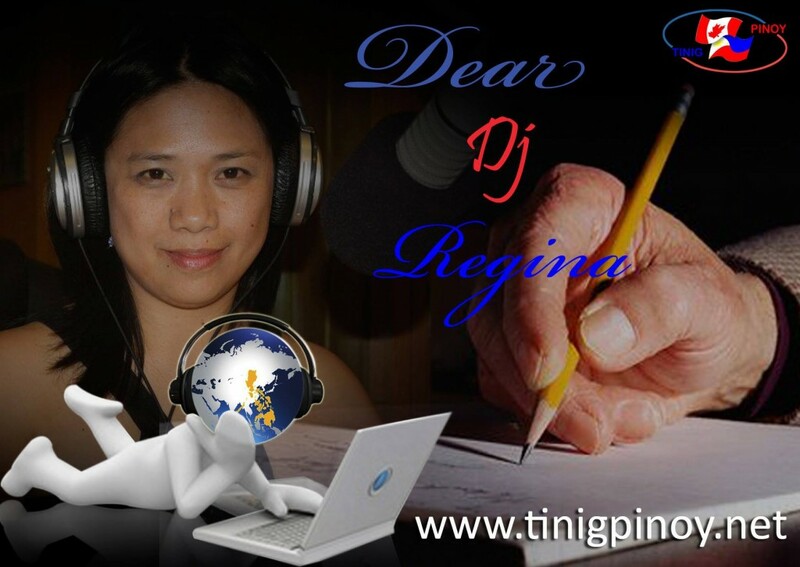 DEAR DJ REGINA brings you information: Issues on Labor & Immigration of OFWs; current events: headlines from the Philippines, showbiz and community news; entertainment: Original Pilipino Music (OPM); Love Notes & Dedication; and community-building: interviews with independent musicians, performers, politicians & governments officials in Canada and the Philippines, and with Tinig Pinoy Radio listeners (“Katinig”) worldwide. The “Let’s hear it straight from you” format interviews authorities allowing listeners to interact real-time through questions or comments online to clarify issues for the benefit of listeners. DEAR DJ REGINA includes a segment for listeners to send personal letters to seek opinions of both host and listeners, or to simply share personal stories for Tinig Pinoy Radio listeners (“Katinig”) worldwide to learn from the experience. DEAR DJ REGINA goes LIVE every Saturday and Sunday, from 9pm to 12am, RP Time, 9am to 12pm EST, 4pm to 7pm Middle East. Contact information: e-mail: regina@tinigpinoy.net skype : tinigpinoy.net. I just want to tell you that I am just all new to blogging and certainly loved your web blog. More than likely I’m want to bookmark your blog . You surely have incredible articles. Cheers for revealing your blog. I simply want to tell you that I am beginner to blogging and site-building and definitely enjoyed you’re page. Almost certainly I’m going to bookmark your blog post . You actually have remarkable writings. Thanks a lot for sharing with us your web page. I simply want to say I am new to blogging and absolutely savored your blog. Almost certainly I’m want to bookmark your site . You actually have tremendous articles and reviews. Cheers for revealing your web page. Hiya, I am genuinely glad I have found this particular info. Nowadays people publish only about chit chat and web goods and this is actually bothersome. A good site together with exciting content, and this I need. Thank you for thus, making this site, and I are going to be visiting again. Does one do newsletters simply by email? I simply want to say I am just very new to blogging and truly enjoyed you’re web-site. Probably I’m want to bookmark your site . You surely come with impressive article content. With thanks for revealing your web site. I just want to say I am new to weblog and certainly liked this blog site. Almost certainly I’m planning to bookmark your website . You really come with superb writings. Thanks a lot for sharing your web page. I simply want to tell you that I am just very new to weblog and really enjoyed your blog site. Almost certainly I’m likely to bookmark your blog post . You amazingly come with terrific posts. Thanks a bunch for sharing your web-site. I simply want to mention I’m all new to blogging and definitely loved this web site. Very likely I’m going to bookmark your site . You amazingly come with incredible articles and reviews. With thanks for revealing your web-site. I simply want to tell you that I am all new to blogs and actually savored your blog. More than likely I’m going to bookmark your blog . You surely have impressive well written articles. Kudos for sharing with us your blog. I simply want to mention I am very new to weblog and certainly liked this blog. Likely I’m want to bookmark your blog post . You absolutely come with amazing writings. Kudos for sharing with us your webpage. Hi there. I discovered your web site via Google even as looking for a related topic, your site came up. It seems to be good. I have bookmarked it in my google bookmarks to come back then. I just want to say I am new to weblog and actually loved your page. Very likely I’m going to bookmark your website . You really have wonderful writings. Regards for revealing your web page. I just want to say I’m new to weblog and truly loved this web page. Probably I’m want to bookmark your site . You really have incredible stories. Cheers for revealing your webpage. Hey there. I discovered your web site by means of Google whilst searching for a similar topic, your web site got here up. It appears to be good. I’ve bookmarked it in my google bookmarks to come back then. But wanna comment on few general items, The site style is perfect, the content material material is really great : D.
Hello there. I found your web site by means of Google at the same time as looking for a related subject, your site came up. It looks good. I’ve bookmarked it in my google bookmarks to come back then. Hi there. I found your site by the use of Google at the same time as searching for a comparable matter, your web site came up. It seems good. I have bookmarked it in my google bookmarks to visit then. Hiya, I am really glad I’ve found this information. Nowadays bloggers publish only about gossip and net stuff and this is actually annoying. A good web site with exciting content, that is what I need. Thank you for making this web site, and I will be visiting again. Do you do newsletters by email? Couldn?t be produced any far better. Reading this post reminds me of my old room mate! He always kept talking about this. I will forward this report to him. Pretty certain he will possess a good read. Thanks for sharing! Hi there. I found your blog by way of Google even as looking for a similar subject, your site got here up. It appears good. I have bookmarked it in my google bookmarks to come back then. Hey there. I discovered your website by way of Google even as searching for a similar topic, your site got here up. It appears to be good. I have bookmarked it in my google bookmarks to visit then. Hiya, I am really glad I’ve found this info. Nowadays bloggers publish just about gossip and web stuff and this is really frustrating. A good web site with exciting content, that’s what I need. Thank you for making this site, and I’ll be visiting again. Do you do newsletters by email? I truly appreciated this amazing weblog. Make certain you maintain up the excellent work. All the finest !!!! Just desire to say your article is as astonishing. The clearness in your submit is simply cool and that i could suppose you are a professional in this subject. Fine together with your permission let me to seize your feed to keep up to date with coming near near post. Thanks a million and please keep up the gratifying work. Hi there. I found your blog by way of Google at the same time as searching for a related matter, your web site got here up. It appears great. I have bookmarked it in my google bookmarks to visit then. Hi there. I found your blog by means of Google even as searching for a similar topic, your web site came up. It looks great. I have bookmarked it in my google bookmarks to come back then. I just want to tell you that I am just new to weblog and truly loved you’re blog site. Probably I’m going to bookmark your website . You amazingly have very good posts. Thanks a lot for sharing your website. Hiya, I am really glad I have found this info. Today bloggers publish only about gossip and internet stuff and this is actually annoying. A good blog with interesting content, this is what I need. Thank you for making this web site, and I’ll be visiting again. Do you do newsletters by email? I simply want to tell you that I am newbie to blogging and site-building and actually savored you’re blog site. Probably I’m want to bookmark your website . You amazingly have good well written articles. Bless you for revealing your webpage. Hiya, I’m really glad I’ve found this information. Today bloggers publish just about gossip and web stuff and this is really frustrating. A good blog with interesting content, this is what I need. Thank you for making this website, and I will be visiting again. Do you do newsletters by email? Hey there. I found your site by means of Google while searching for a related matter, your web site came up. It looks great. I’ve bookmarked it in my google bookmarks to visit then. Hi there, just became aware of your weblog via Google, and discovered that it is truly informative. I am going to watch out for brussels. Iâ€™ll be grateful should you continue this in future. Numerous folks will be benefited from your writing. Cheers! Most I can state is, I donâ€™t know what to comment! Except needless to say, for the superb suggestions which are shared with this blog. Iâ€™ll believe of a thousand enjoyable strategies to read the posts on this site. I do feel I will lastly take a step with your guidelines on areas I could never have been able to manage alone. You are so careful to permit me to be 1 of those to benefit from your beneficial info. Please recognize how a lot I’m thankful. Great – I should definitely pronounce, impressed with your web site. I had no trouble navigating through all the tabs as well as related information ended up being truly simple to do to access. I recently found what I hoped for before you know it in the least. Reasonably unusual. Is likely to appreciate it for those who add forums or anything, site theme . a tones way for your client to communicate. Excellent task..
Hi there. I found your web site by way of Google at the same time as searching for a comparable topic, your site got here up. It looks good. I have bookmarked it in my google bookmarks to visit then. Hiya, I am really glad I have found this information. Nowadays bloggers publish only about gossip and internet stuff and this is actually irritating. A good web site with interesting content, that’s what I need. Thank you for making this site, and I’ll be visiting again. Do you do newsletters by email? Hello there. I discovered your website by way of Google at the same time as looking for a comparable topic, your web site came up. It appears good. I have bookmarked it in my google bookmarks to visit then. Hiya, I am really glad I’ve found this info. Nowadays bloggers publish just about gossip and internet stuff and this is actually irritating. A good web site with exciting content, this is what I need. Thank you for making this web-site, and I will be visiting again. Do you do newsletters by email? Hiya, I’m really glad I’ve found this information. Nowadays bloggers publish just about gossip and net stuff and this is really irritating. A good website with interesting content, that is what I need. Thank you for making this web-site, and I’ll be visiting again. Do you do newsletters by email? Hey there. I found your website by way of Google at the same time as searching for a similar subject, your web site got here up. It appears to be great. I’ve bookmarked it in my google bookmarks to come back then. Hi there. I discovered your website via Google whilst looking for a comparable subject, your website came up. It looks great. I have bookmarked it in my google bookmarks to visit then. My Partner And I just desire to share it with you in which I’m just fresh to posting and thoroughly valued your post. Probably I am likely to remember your post post . You simply have extraordinary review reports. Be Grateful For it for sharing with all of us your website report. Hiya, I am really glad I have found this information. Nowadays bloggers publish just about gossip and net stuff and this is really frustrating. A good website with interesting content, that is what I need. Thank you for making this web site, and I’ll be visiting again. Do you do newsletters by email? Hiya, I am really glad I’ve found this information. Nowadays bloggers publish just about gossip and net stuff and this is really frustrating. A good blog with interesting content, that is what I need. Thanks for making this web site, and I will be visiting again. Do you do newsletters by email? Hiya, I’m really glad I’ve found this info. Nowadays bloggers publish only about gossip and web stuff and this is really annoying. A good site with interesting content, that’s what I need. Thanks for making this web site, and I’ll be visiting again. Do you do newsletters by email? Hello there. I discovered your website by means of Google at the same time as searching for a related matter, your site came up. It appears great. I have bookmarked it in my google bookmarks to visit then. Together with everything that appears to be building within this subject matter, all your perspectives are actually relatively refreshing. On the other hand, I beg your pardon, because I can not give credence to your whole plan, all be it exhilarating none the less. It seems to me that your remarks are generally not entirely validated and in fact you are generally yourself not really wholly convinced of the point. In any event I did appreciate reading through it. Hiya, I am really glad I’ve found this information. Nowadays bloggers publish just about gossip and net stuff and this is actually irritating. A good blog with exciting content, that’s what I need. Thanks for making this web site, and I’ll be visiting again. Do you do newsletters by email? Hello there. I discovered your website via Google even as looking for a similar topic, your site came up. It appears to be great. I have bookmarked it in my google bookmarks to visit then. Hi there. I found your site via Google while looking for a comparable matter, your web site came up. It seems great. I’ve bookmarked it in my google bookmarks to visit then. hello there and thanks on your info – I’ve definitely picked up anything new from proper here. I did however experience some technical points the usage of this web site, since I experienced to reload the site many occasions prior to I may get it to load properly. I have been thinking about in case your hosting is OK? Not that I’m complaining, however slow loading circumstances instances will often have an effect on your placement in google and can injury your quality rating if ads with Adwords. Well I am including this RSS to my email and can glance out for much more of your respective interesting content. Make sure you replace this once more soon..
you’re in point of fact a just right webmaster. The web site loading velocity is amazing. It kind of feels that you’re doing any unique trick. Furthermore, The contents are masterwork. you’ve done a magnificent activity on this subject! What’s Happening i’m new to this, I stumbled upon this I’ve discovered It positively helpful and it has helped me out loads. I hope to give a contribution & help other users like its helped me. Good job. Hiya, I am really glad I have found this information. Nowadays bloggers publish just about gossip and internet stuff and this is actually annoying. A good site with exciting content, this is what I need. Thank you for making this web-site, and I’ll be visiting again. Do you do newsletters by email? Hey there. I found your blog by way of Google even as searching for a comparable subject, your website got here up. It seems to be good. I have bookmarked it in my google bookmarks to come back then. Hiya, I’m really glad I have found this information. Today bloggers publish just about gossip and internet stuff and this is really irritating. A good web site with interesting content, this is what I need. Thanks for making this website, and I’ll be visiting again. Do you do newsletters by email? Hiya, I’m really glad I have found this info. Nowadays bloggers publish just about gossip and web stuff and this is actually frustrating. A good web site with exciting content, that is what I need. Thanks for making this website, and I will be visiting again. Do you do newsletters by email? whoah this weblog is fantastic i really like reading your posts. Maintain up the fantastic function! You already know, plenty of persons are seeking round for this information, it is possible to aid them greatly. Hi there. I found your blog by the use of Google at the same time as searching for a similar subject, your website got here up. It appears great. I’ve bookmarked it in my google bookmarks to come back then. Hiya, I’m really glad I’ve found this info. Today bloggers publish just about gossip and web stuff and this is really frustrating. A good site with interesting content, that’s what I need. Thank you for making this web site, and I’ll be visiting again. Do you do newsletters by email? I basically couldnâ€™t go away your site before suggesting that I truly enjoyed the normal info an individual supply on your visitors? Is gonna be back regularly in order to inspect new posts. Hiya, I am really glad I’ve found this information. Today bloggers publish just about gossip and net stuff and this is really annoying. A good website with interesting content, that’s what I need. Thank you for making this web site, and I’ll be visiting again. Do you do newsletters by email? Hi there. I discovered your website by means of Google whilst searching for a comparable topic, your website got here up. It seems to be good. I’ve bookmarked it in my google bookmarks to come back then. This is a good tip particularly to those fresh to the blogosphere. Brief but very precise information… Thank you for sharing this one. A must read article! Hiya, I’m really glad I have found this information. Nowadays bloggers publish just about gossip and internet stuff and this is really frustrating. A good website with exciting content, that is what I need. Thank you for making this site, and I’ll be visiting again. Do you do newsletters by email? Hiya, I am really glad I’ve found this information. Today bloggers publish just about gossip and net stuff and this is actually annoying. A good site with interesting content, this is what I need. Thank you for making this site, and I’ll be visiting again. Do you do newsletters by email? Hello there. I discovered your blog by way of Google while searching for a comparable subject, your website got here up. It looks great. I have bookmarked it in my google bookmarks to visit then. Hello there. I found your web site by means of Google while looking for a comparable subject, your web site got here up. It appears good. I’ve bookmarked it in my google bookmarks to visit then. Incredibly informative suggestions you have stated, thank you for submitting. Hello there! This article could not be written much better! Reading through this post reminds me of my previous roommate! He constantly kept preaching about this. I am going to send this post to him. Fairly certain he’s going to have a good read. Thanks for sharing! Nice article post. Thanks a ton for discussing with the readers. I am bookmarking this excellent write up for long term studying. Impressive short article. Thank-you for discussing with our team. I am bookmarking this unique article for long term reviewing. How is it that just anyone can publish a blog and get as popular as this? Its not like youve said something incredibly impressive -more like youve painted a quite picture above an issue which you know nothing about! I dont want to sound mean, right here. But do you surely think that you can get away with adding some quite pictures and not genuinely say anything? You made various excellent points there. I did a search on the topic and located most people will have the same opinion with your weblog. Only a smiling visitant here to share the really like (:, btw great style and style . Hiya, I am really glad I’ve found this info. Today bloggers publish just about gossip and net stuff and this is really frustrating. A good blog with exciting content, that’s what I need. Thank you for making this web-site, and I will be visiting again. Do you do newsletters by email? Hiya, I am really glad I’ve found this info. Today bloggers publish just about gossip and net stuff and this is actually annoying. A good website with interesting content, this is what I need. Thanks for making this web site, and I’ll be visiting again. Do you do newsletters by email? My wife and I just intend to inform you which I’m just fresh to blog posting and completely adored your work. Likely I am inclined to save your blog post . You simply have lovely information reports. Admire it for share-out with me your blog page. Really good information. Thank you for discussing with the people in the us. I am bookmarking this excellent blog entry for long term viewing. Hello there, just became aware of your blog via Google, and found that it’s truly informative. I’m going to be careful for brussels. I’ll appreciate for those who continue this in future. Numerous other folks will be benefited out of your writing. Cheers! My wife and I just need to reveal to you which I’m really newbie to blog posting and genuinely cherished your page. Quite possibly I am most likely to store your webpage post . You undoubtedly have excellent article subject. Delight In it for swapping with our company your site report. Extremely fascinating points you might have observed , thanks for posting . My brother suggested I may like this website. He was once totally right. This post actually made my day. You can not believe simply how much time I had spent for this information! Thanks! I wasnâ€™t positive exactly where to ask this, i wondered if the author could reply. Your weblog looks brilliant and I wondered what theme and program you used? Any aid would be a big assist and i would be extremely greatful as I am inside the procedure of beginning a weblog comparable to this topic! Hello! Iâ€™ve been following your weblog for a while now and finally got the courage to go ahead and give you a shout out from Kingwood Texas! Just wanted to mention maintain up the excellent work! I am really enjoying the theme/design of your website. Do you ever run into any web browser compatibility issues? A handful of my blog audience have complained about my website not working correctly in Explorer but looks great in Opera. Do you have any ideas to help fix this issue? Hiya, I’m really glad I’ve found this info. Nowadays bloggers publish just about gossip and web stuff and this is really annoying. A good blog with interesting content, that is what I need. Thank you for making this site, and I will be visiting again. Do you do newsletters by email? Now I really intend to tell you the fact that I am raw to writing a blog and thoroughly valued your site. Very possible I am prone to save your blog post . You really have fabulous report topic. Like it for expressing with our site your web document. Hiya, I am really glad I’ve found this information. Today bloggers publish only about gossip and web stuff and this is actually annoying. A good blog with interesting content, that’s what I need. Thank you for making this site, and I’ll be visiting again. Do you do newsletters by email? Hiya, I’m really glad I have found this info. Today bloggers publish just about gossip and web stuff and this is really frustrating. A good web site with exciting content, that’s what I need. Thanks for making this web-site, and I’ll be visiting again. Do you do newsletters by email? Hiya, I am really glad I’ve found this info. Nowadays bloggers publish just about gossip and web stuff and this is actually frustrating. A good blog with exciting content, that’s what I need. Thanks for making this site, and I will be visiting again. Do you do newsletters by email? Hiya, I am really glad I have found this information. Nowadays bloggers publish only about gossip and net stuff and this is really irritating. A good site with exciting content, this is what I need. Thanks for making this website, and I’ll be visiting again. Do you do newsletters by email? Hiya, I am really glad I have found this information. Nowadays bloggers publish only about gossip and net stuff and this is really frustrating. A good site with interesting content, this is what I need. Thanks for making this site, and I will be visiting again. Do you do newsletters by email? Hey! This is my 1st comment here so I just wanted to give a quick shout out and tell you I really enjoy reading through your blog posts. Can you recommend any other blogs/websites/forums that deal with the same topics? Thanks a lot! Hiya, I am really glad I’ve found this information. Nowadays bloggers publish only about gossip and web stuff and this is actually irritating. A good web site with interesting content, that’s what I need. Thank you for making this site, and I will be visiting again. Do you do newsletters by email? Hey there. I discovered your site by way of Google while searching for a similar subject, your site came up. It looks great. I’ve bookmarked it in my google bookmarks to visit then. Hello there. I discovered your web site by the use of Google while looking for a similar subject, your site got here up. It looks good. I’ve bookmarked it in my google bookmarks to visit then. Hi there. I found your site by the use of Google at the same time as searching for a similar topic, your web site got here up. It seems to be good. I have bookmarked it in my google bookmarks to come back then. Hi there. I discovered your blog by means of Google at the same time as searching for a related matter, your website got here up. It seems great. I’ve bookmarked it in my google bookmarks to come back then. Hiya, I am really glad I’ve found this info. Today bloggers publish only about gossip and web stuff and this is actually irritating. A good site with exciting content, that’s what I need. Thank you for making this site, and I’ll be visiting again. Do you do newsletters by email? Normally I don’t learn article on blogs, however I wish to say that this write-up very pressured me to take a look at and do so! Your writing taste has been surprised me. Thanks, very nice article. Wow, wonderful weblog structure! How long have you been running a blog for? you made running a blog look easy. The whole appear of your site is magnificent, neatly as the content material! We merely intend to advise you the fact that I’m really fresh to blog posting and utterly cherished your post. Quite possibly I am likely to bookmark your blog post . You really have stunning report subject. Value it for discussing with us your url webpage. Hello there. I discovered your web site by the use of Google while searching for a similar matter, your website came up. It seems to be good. I have bookmarked it in my google bookmarks to come back then. Hiya, I am really glad I have found this info. Nowadays bloggers publish just about gossip and internet stuff and this is really annoying. A good web site with exciting content, that is what I need. Thank you for making this site, and I’ll be visiting again. Do you do newsletters by email? I do agree with all the ideas you’ve presented in your post. They are very convincing and will certainly work. Nonetheless, the posts are too quick for novices. May just you please lengthen them a bit from next time? Thank you for the post. My hubby and I really have to reveal to you in which I am certain novice to writing and certainly cherished your work. Quite possibly I am prone to save your web post . You certainly have superb piece stuff. Like it for swapping with the two of us your blog post. You made some respectable factors there. I looked on the web for the issue and located most people will associate with with your website. My spouse and I really want to reveal to you in which I’m really raw to writing and totally loved your work. Very possible I am most likely to remember your webpage post . You certainly have stunning posting content. Acknowledge it for telling with the two of us your blog article. Hi there. I found your blog via Google at the same time as looking for a similar topic, your web site got here up. It seems good. I’ve bookmarked it in my google bookmarks to visit then. Hey there. I discovered your website by way of Google while searching for a comparable subject, your web site came up. It seems to be good. I’ve bookmarked it in my google bookmarks to come back then. Hiya, I am really glad I’ve found this info. Today bloggers publish just about gossip and internet stuff and this is really irritating. A good blog with interesting content, this is what I need. Thank you for making this site, and I will be visiting again. Do you do newsletters by email? Hiya, I’m really glad I have found this info. Nowadays bloggers publish just about gossip and web stuff and this is really irritating. A good blog with interesting content, this is what I need. Thanks for making this web site, and I will be visiting again. Do you do newsletters by email? Quite fascinating subject , appreciate it for putting up. Hiya, I am really glad I’ve found this information. Nowadays bloggers publish just about gossip and internet stuff and this is really irritating. A good website with interesting content, this is what I need. Thank you for making this web site, and I’ll be visiting again. Do you do newsletters by email? I’m having a little problem I cant subscribe your feed, I’m utilizing google reader fyi. Hiya, I am really glad I’ve found this info. Today bloggers publish only about gossip and net stuff and this is really annoying. A good website with exciting content, this is what I need. Thanks for making this site, and I’ll be visiting again. Do you do newsletters by email? This has been unbelievably generous of people like you to grant publicly what exactly some people could possibly have advertised for an e-book to end up making some dough on their own, mostly given that you might well have done it in the event you wanted. The tactics likewise acted to become a easy way to be sure that other people online have similar dreams the same as mine to grasp a little more pertaining to this matter. I’m certain there are several more fun situations in the future for people who scan your blog post. Hello there. I found your web site by the use of Google even as looking for a related subject, your site came up. It seems good. I have bookmarked it in my google bookmarks to visit then. Hello there. I found your website by means of Google whilst searching for a related topic, your site came up. It appears to be good. I’ve bookmarked it in my google bookmarks to visit then. A person essentially help to make seriously posts I might state. This is the very first time I frequented your web page and so far? I surprised with the research you made to make this particular publish extraordinary. Great process! Hello there. I discovered your site by the use of Google while searching for a related subject, your site got here up. It seems great. I have bookmarked it in my google bookmarks to come back then. Hey there. I discovered your blog by the use of Google while searching for a similar subject, your web site came up. It appears good. I’ve bookmarked it in my google bookmarks to come back then. Hey there. I found your web site by way of Google at the same time as searching for a similar topic, your site came up. It appears to be great. I’ve bookmarked it in my google bookmarks to come back then. Hey there. I discovered your blog by means of Google while looking for a comparable subject, your site got here up. It appears to be good. I’ve bookmarked it in my google bookmarks to visit then. Nice post. I learn something more challenging on different blogs everyday. It can always be stimulating to read content material from different writers and practice a bit of something from their store. I’d desire to use some with the content on my weblog whether or not you don’t mind. Natually I’ll give you a hyperlink on your web blog. Thanks for sharing. Hi there. I discovered your website by means of Google while searching for a similar topic, your web site came up. It seems to be good. I have bookmarked it in my google bookmarks to visit then. While I really have to notify you the fact that I am fresh to posting and certainly enjoyed your website. Most likely I am probably to bookmark your site post . You truly have lovely information stuff. Be Thankful For it for discussing with us all your internet report. Hello there. I found your site by the use of Google whilst searching for a related topic, your web site came up. It appears great. I have bookmarked it in my google bookmarks to visit then. Hello there. I found your web site via Google while looking for a related subject, your web site came up. It looks great. I’ve bookmarked it in my google bookmarks to come back then. Hello there. I discovered your website by way of Google at the same time as searching for a similar topic, your site came up. It seems great. I have bookmarked it in my google bookmarks to come back then. Nice read, I just passed this onto a colleague who was doing a little research on that. And he just bought me lunch since I found it for him smile Therefore let me rephrase that: Thank you for lunch! “Whenever you have an efficient government you have a dictatorship.” by Harry S Truman. Hiya, I am really glad I have found this info. Today bloggers publish just about gossip and web stuff and this is actually irritating. A good site with interesting content, this is what I need. Thanks for making this web site, and I will be visiting again. Do you do newsletters by email? Hi there. I discovered your web site by the use of Google even as searching for a related matter, your site came up. It seems to be great. I have bookmarked it in my google bookmarks to visit then. Hello there. I found your site by way of Google even as searching for a comparable topic, your site came up. It seems great. I have bookmarked it in my google bookmarks to come back then. Hello there. I discovered your web site by way of Google whilst searching for a related subject, your web site came up. It appears great. I have bookmarked it in my google bookmarks to come back then. I see something truly intriguing about your internet site so I saved to bookmarks . wonderful issues altogether, you just gained a brand new reader. What might you suggest about your post that you simply made a few days ago? Any certain? This has been incredibly generous with people like you to give easily just what many individuals would’ve sold for an electronic book to get some profit on their own, even more so seeing that you could have done it if you ever wanted. Those inspiring ideas in addition served as the great way to fully grasp other people online have a similar eagerness just like mine to figure out whole lot more with regard to this problem. I think there are some more fun sessions up front for folks who check out your website. Informative Siteâ€¦ Hello guys here are some links that contains data that you may possibly locate beneficial yourselves. Itâ€™s Worth Checking outâ€¦. Hi there. I found your website by means of Google at the same time as looking for a similar matter, your site got here up. It seems good. I have bookmarked it in my google bookmarks to visit then. Hiya, I’m really glad I have found this information. Nowadays bloggers publish just about gossip and web stuff and this is really frustrating. A good blog with interesting content, that’s what I need. Thanks for making this web site, and I’ll be visiting again. Do you do newsletters by email? Hello there. I found your blog via Google whilst looking for a related matter, your website got here up. It appears great. I have bookmarked it in my google bookmarks to come back then. Some genuinely fascinating info, effectively written and generally user genial . Hello there. I found your site by way of Google whilst looking for a related topic, your web site came up. It appears great. I’ve bookmarked it in my google bookmarks to visit then. Hiya, I am really glad I have found this information. Nowadays bloggers publish just about gossip and net stuff and this is actually irritating. A good site with interesting content, this is what I need. Thank you for making this web-site, and I’ll be visiting again. Do you do newsletters by email? Rapidly and easily build your web traffic and PR, which provides Internet site visitors to add your page to any social bookmarking web site. Hiya, I’m really glad I have found this info. Nowadays bloggers publish only about gossip and internet stuff and this is actually annoying. A good site with interesting content, that’s what I need. Thanks for making this website, and I’ll be visiting again. Do you do newsletters by email? Hiya, I am really glad I have found this info. Today bloggers publish only about gossip and web stuff and this is actually frustrating. A good website with exciting content, that is what I need. Thanks for making this web-site, and I will be visiting again. Do you do newsletters by email? This site is my breathing in, real amazing design and perfect content material . Hiya, I am really glad I’ve found this information. Nowadays bloggers publish just about gossip and web stuff and this is actually frustrating. A good site with exciting content, this is what I need. Thank you for making this web-site, and I will be visiting again. Do you do newsletters by email? Hello there. I discovered your website via Google whilst looking for a similar matter, your website got here up. It looks good. I have bookmarked it in my google bookmarks to visit then. Hi there. I found your web site via Google whilst looking for a similar subject, your web site got here up. It appears good. I’ve bookmarked it in my google bookmarks to come back then. Hi there. I discovered your blog by way of Google whilst looking for a similar matter, your site got here up. It seems to be good. I have bookmarked it in my google bookmarks to visit then. Hey there. I discovered your site by means of Google even as looking for a similar topic, your web site came up. It seems great. I have bookmarked it in my google bookmarks to visit then. Hiya, I am really glad I have found this info. Nowadays bloggers publish only about chat and web stuff and this is actually irritating. A good site along with exciting content, this is just what I need. Thank you for creating this site, and I will probably be visiting again. Would you do newsletters through email? Hiya, I’m really glad I have found this info. Nowadays bloggers publish just about gossip and net stuff and this is really frustrating. A good blog with exciting content, that’s what I need. Thanks for making this web-site, and I’ll be visiting again. Do you do newsletters by email? Hello there. I found your site by the use of Google even as searching for a similar topic, your website got here up. It seems to be great. I’ve bookmarked it in my google bookmarks to visit then. Along with almost everything which appears to be developing throughout this subject material, your opinions are generally very exciting. Nevertheless, I beg your pardon, but I do not subscribe to your entire idea, all be it stimulating none the less. It seems to us that your remarks are not completely validated and in fact you are yourself not even completely certain of your point. In any event I did take pleasure in examining it. Strong weblog. I acquired several nice info. I?ve been keeping a watch on this technology for a few time. It?utes attention-grabbing the method it retains entirely different, nonetheless a lot of of the primary components remain a related. have you observed a great deal change since Search engines designed their very own latest purchase within the field? Hiya, I am really glad I have found this information. Today bloggers publish only about gossip and web stuff and this is actually frustrating. A good web site with interesting content, that is what I need. Thanks for making this web site, and I will be visiting again. Do you do newsletters by email? Merely wanna input that you have a very good web site , I enjoy the pattern it truly stands out. Hello there. I found your blog by means of Google at the same time as searching for a comparable subject, your website came up. It appears to be good. I’ve bookmarked it in my google bookmarks to visit then. Hey there. I found your web site by means of Google at the same time as looking for a similar matter, your website came up. It seems great. I have bookmarked it in my google bookmarks to visit then. I really desire to show you the fact that I am certain raw to writing a blog and extremely cherished your post. More than likely I am going to bookmark your web post . You certainly have lovely write-up posts. Like it for giving out with all of us your web article. Aw, it was quite a good post. In idea I’ve to put in writing such as this moreover – taking time and actual effort to produce a excellent article… but what / issues I say… I procrastinate alot through no indicates manage to get something completed. I’m often to blogging and i really respect your content. The article has really peaks my interest. I’m going to bookmark your site and preserve checking for new information. Hello there. I discovered your website by the use of Google at the same time as looking for a comparable subject, your site came up. It appears to be good. I’ve bookmarked it in my google bookmarks to come back then. Hello there. I found your blog by way of Google at the same time as looking for a comparable topic, your site came up. It appears good. I’ve bookmarked it in my google bookmarks to visit then. Hey there. I discovered your website by means of Google even as searching for a comparable topic, your website got here up. It appears good. I have bookmarked it in my google bookmarks to visit then. Hiya, I am really glad I have found this info. Nowadays bloggers publish just about gossip and net stuff and this is really frustrating. A good website with exciting content, that is what I need. Thanks for making this website, and I’ll be visiting again. Do you do newsletters by email? Hey there. I found your website by way of Google at the same time as looking for a similar matter, your site came up. It seems good. I have bookmarked it in my google bookmarks to visit then. Hi there. I discovered your web site by the use of Google at the same time as searching for a comparable topic, your site got here up. It appears good. I have bookmarked it in my google bookmarks to visit then. Hiya, I am really glad I’ve found this info. Nowadays bloggers publish just about gossip and net stuff and this is actually frustrating. A good website with exciting content, this is what I need. Thanks for making this website, and I’ll be visiting again. Do you do newsletters by email? It is certainly strangely generous of people like you to allow unhampered all that many of us could have sold for an e-book to make some profit on their own, primarily considering that you could have done it if you ever desired. The guidelines in addition worked like the fantastic way to realize that other people online have similar interest much like mine to grasp good deal more in terms of this issue. I am certain there are some more pleasant instances ahead for people who check out your blog post. Hi there. I found your site via Google even as searching for a comparable topic, your website came up. It looks great. I’ve bookmarked it in my google bookmarks to come back then. Hi there. I found your blog by means of Google whilst searching for a similar topic, your site got here up. It appears great. I have bookmarked it in my google bookmarks to come back then. Hey there. I discovered your site by the use of Google even as searching for a similar matter, your site came up. It seems to be great. I have bookmarked it in my google bookmarks to visit then. Hiya, I am really glad I have found this info. Nowadays bloggers publish only about gossip and net stuff and this is really annoying. A good website with exciting content, this is what I need. Thank you for making this website, and I will be visiting again. Do you do newsletters by email? Hey there. I found your website by the use of Google at the same time as looking for a related subject, your website came up. It seems great. I have bookmarked it in my google bookmarks to come back then. Identified your weblog and decided to have a study on it, not what I usually do, but this blog is fantastic. Awesome to see a site that’s not spammed, and truly makes some sense. Anyway, excellent write up. Hey there. I discovered your web site by means of Google even as searching for a similar topic, your site came up. It seems great. I have bookmarked it in my google bookmarks to come back then. Hiya, I am really glad I’ve found this information. Nowadays bloggers publish only about gossip and web stuff and this is actually annoying. A good site with interesting content, that’s what I need. Thanks for making this website, and I’ll be visiting again. Do you do newsletters by email? After study a few with the weblog posts on your website now, and I truly like your way of blogging. I bookmarked it to my bookmark web site list and will likely be checking back soon. Pls have a look at my internet website as nicely and let me know what you believe. I have recently started a web site, the information you offer on this website has helped me greatly. Thank you for all of your time & work. “Show me the man who keeps his house in hand, He’s fit for public authority.” by Sophocles. Hiya, I am really glad I have found this info. Today bloggers publish just about gossip and net stuff and this is really frustrating. A good blog with exciting content, that is what I need. Thanks for making this site, and I’ll be visiting again. Do you do newsletters by email? Hi there. I discovered your site by the use of Google at the same time as searching for a comparable matter, your site got here up. It seems great. I have bookmarked it in my google bookmarks to visit then. Hello very cool web site!! Guy .. Beautiful .. Amazing .. I will bookmark your site and take the feeds also…I’m satisfied to search out so many helpful info here in the submit, we want work out extra strategies in this regard, thank you for sharing. . . . . . This has been so surprisingly open-handed of people like you to provide openly just what a few individuals could have offered as an e book to make some profit for their own end, precisely seeing that you could possibly have tried it if you wanted. These solutions in addition worked to become fantastic way to fully grasp most people have similar dreams the same as my own to see a little more in regard to this problem. I think there are thousands of more pleasant situations up front for many who check out your blog. I have been browsing on-line greater than 3 hours today, yet I by no means discovered any attention-grabbing article like yours. It is lovely value sufficient for me. In my view, if all site owners and bloggers made excellent content as you did, the net might be much more helpful than ever before. “I thank God for my handicaps, for through them, I have found myself, my work and my God.” by Hellen Keller. Hiya, I am really glad I have found this info. Today bloggers publish just about gossip and web stuff and this is really irritating. A good blog with interesting content, that is what I need. Thank you for making this web site, and I’ll be visiting again. Do you do newsletters by email? Hiya, I’m really glad I have found this info. Nowadays bloggers publish just about gossip and internet stuff and this is really annoying. A good web site with exciting content, this is what I need. Thank you for making this web-site, and I will be visiting again. Do you do newsletters by email? Hiya, I’m really glad I’ve found this information. Nowadays bloggers publish only about gossip and net stuff and this is actually frustrating. A good site with exciting content, that’s what I need. Thank you for making this site, and I will be visiting again. Do you do newsletters by email? Hiya, I’m really glad I’ve found this info. Nowadays bloggers publish just about gossip and net stuff and this is actually irritating. A good web site with interesting content, that is what I need. Thank you for making this website, and I will be visiting again. Do you do newsletters by email? Hiya, I’m really glad I’ve found this info. Today bloggers publish only about gossip and internet stuff and this is really frustrating. A good blog with exciting content, this is what I need. Thank you for making this web-site, and I will be visiting again. Do you do newsletters by email? I believe this internet site contains some rattling great information for everyone :D. “Nothing surely is so disgraceful to society and to individuals as unmeaning wastefulness.” by Count Benjamin Thompson Rumford. Hiya, I am really glad I have found this information. Nowadays bloggers publish just about gossip and web stuff and this is actually annoying. A good web site with exciting content, that is what I need. Thanks for making this website, and I’ll be visiting again. Do you do newsletters by email? Hello there. I found your site via Google while searching for a comparable matter, your web site got here up. It seems great. I’ve bookmarked it in my google bookmarks to visit then. Pretty insightful points you have said, thanks for adding. This has been certainly wonderfully generous with people like you to present easily what most people might have supplied for an e-book to help make some dough for their own end, precisely considering that you could possibly have tried it in the event you wanted. The secrets also served to become a great way to realize that other people have the same dreams just like mine to see great deal more regarding this condition. Certainly there are a lot more pleasurable sessions up front for people who take a look at your site. Hiya, I’m really glad I’ve found this info. Nowadays bloggers publish just about gossip and web stuff and this is actually irritating. A good website with interesting content, that is what I need. Thanks for making this website, and I will be visiting again. Do you do newsletters by email? Hiya, I’m really glad I’ve found this information. Nowadays bloggers publish only about gossip and internet stuff and this is really annoying. A good web site with exciting content, that is what I need. Thanks for making this site, and I will be visiting again. Do you do newsletters by email? Hey there. I found your website by means of Google at the same time as looking for a related topic, your site came up. It appears to be good. I’ve bookmarked it in my google bookmarks to come back then. Hiya, I’m really glad I have found this info. Today bloggers publish just about gossip and web stuff and this is really annoying. A good website with interesting content, that is what I need. Thank you for making this site, and I’ll be visiting again. Do you do newsletters by email? Hiya, I am really glad I’ve found this info. Today bloggers publish just about gossip and web stuff and this is really irritating. A good blog with interesting content, this is what I need. Thanks for making this web site, and I will be visiting again. Do you do newsletters by email? Hello there. I found your blog by means of Google whilst looking for a comparable topic, your site got here up. It appears great. I have bookmarked it in my google bookmarks to come back then. Some genuinely nice and useful information on this website, as well I believe the style contains great features. Hey there. I found your site by means of Google whilst searching for a related topic, your website got here up. It appears great. I’ve bookmarked it in my google bookmarks to visit then. Hey there. I found your blog by the use of Google while looking for a related subject, your web site got here up. It appears good. I’ve bookmarked it in my google bookmarks to visit then. Hello there. I discovered your site via Google at the same time as searching for a similar subject, your site got here up. It seems good. I’ve bookmarked it in my google bookmarks to come back then. Hey there. I discovered your website via Google whilst searching for a related topic, your website got here up. It appears to be great. I’ve bookmarked it in my google bookmarks to come back then. Hiya, I’m really glad I have found this information. Today bloggers publish just about gossip and internet stuff and this is really irritating. A good blog with interesting content, this is what I need. Thank you for making this web site, and I’ll be visiting again. Do you do newsletters by email? This has been quite incredibly open-handed of people like you to give unhampered what numerous people might have advertised as an e book in order to make some money on their own, most importantly given that you might well have done it if you considered necessary. Those pointers also worked to be the easy way to be sure that someone else have the same zeal just like mine to know the truth lots more pertaining to this condition. I think there are a lot more pleasurable opportunities ahead for folks who browse through your blog post. Absolute informative specifics that you have remarked, thank you for posting. Hey there. I found your blog via Google even as looking for a comparable matter, your site came up. It seems great. I’ve bookmarked it in my google bookmarks to come back then. I think youve produced some genuinely fascinating points. Not too many individuals would in fact consider this the way you just did. Im truly impressed that theres so substantially about this subject thats been uncovered and you did it so properly, with so a whole lot class. Very good 1 you, man! Genuinely excellent stuff here. I appreciate you taking the time to create this post. It has been actually valuable to me undoubtedly. Value it. An impressive share! I have just forwarded this onto a friend who has been conducting a little research on this. And he actually ordered me lunch simply because I found it for him… lol. So let me reword this…. Thank YOU for the meal!! But yeah, thanx for spending the time to talk about this subject here on your blog. Hola! Quick question that is completely off issue. Do you know how to make your blog mobile friendly? My very own internet site looks weird when browsing from my apple iphone. I am just trying to uncover some sort of template or wordpress tool that may well have the ability to correct this problem. For those who have any suggestions, remember to share. With thanks! While I simply need to advise you that I am certain young to writing a blog and genuinely loved your page. Most likely I am likely to store your web post . You definitely have lovely posting topic. Be Grateful For it for telling with the people in the us your blog post. Quite alluring highlights you have stated, thank you so much for publishing. Hi there. I discovered your site by the use of Google even as searching for a comparable subject, your site came up. It seems to be great. I’ve bookmarked it in my google bookmarks to visit then. Hiya, I’m really glad I’ve found this information. Nowadays bloggers publish only about gossip and web stuff and this is actually frustrating. A good blog with exciting content, that’s what I need. Thank you for making this site, and I’ll be visiting again. Do you do newsletters by email? Hey there. I found your website by the use of Google whilst looking for a similar subject, your web site came up. It seems great. I have bookmarked it in my google bookmarks to visit then. Thank you for sharing excellent informations. Your web site is very cool. I am impressed by the details that you’ve on this web site. It reveals how nicely you perceive this subject. Bookmarked this website page, will come back for extra articles. You, my pal, ROCK! I found just the information I already searched all over the place and simply could not come across. What an ideal site. This site is my aspiration , extremely fantastic pattern and perfect articles . Hi there. I found your site by means of Google at the same time as looking for a similar matter, your site came up. It appears to be good. I have bookmarked it in my google bookmarks to come back then. Hi there. I found your website by means of Google at the same time as searching for a similar matter, your web site got here up. It seems great. I have bookmarked it in my google bookmarks to visit then. Hi there. I found your website by the use of Google while searching for a similar matter, your site got here up. It seems to be good. I’ve bookmarked it in my google bookmarks to visit then. Hey there. I discovered your site by way of Google while searching for a comparable topic, your web site got here up. It seems good. I have bookmarked it in my google bookmarks to visit then. Hiya, I am really glad I’ve found this info. Nowadays bloggers publish just about gossip and internet stuff and this is actually annoying. A good website with interesting content, that’s what I need. Thank you for making this site, and I will be visiting again. Do you do newsletters by email? Hi there. I discovered your website by way of Google while looking for a comparable matter, your web site got here up. It appears great. I have bookmarked it in my google bookmarks to come back then. Hiya, I’m really glad I have found this info. Today bloggers publish just about gossip and web stuff and this is actually frustrating. A good website with interesting content, that’s what I need. Thank you for making this site, and I will be visiting again. Do you do newsletters by email? Hiya, I’m really glad I have found this info. Nowadays bloggers publish just about gossip and net stuff and this is actually annoying. A good site with exciting content, that is what I need. Thanks for making this web-site, and I will be visiting again. Do you do newsletters by email? Hi there. I discovered your website by the use of Google while looking for a similar matter, your site came up. It seems to be great. I’ve bookmarked it in my google bookmarks to visit then. Hey there. I found your site via Google at the same time as searching for a related topic, your site came up. It appears to be good. I have bookmarked it in my google bookmarks to come back then. Hiya, I am really glad I have found this info. Today bloggers publish just about gossip and net stuff and this is actually frustrating. A good website with exciting content, this is what I need. Thanks for making this web-site, and I’ll be visiting again. Do you do newsletters by email? Hi there. I discovered your website by the use of Google whilst looking for a similar subject, your website came up. It seems to be good. I have bookmarked it in my google bookmarks to come back then. Of course like your site but you require to check the spelling on several of your posts. Several of them are rife with spelling troubles and I uncover it really bothersome to tell the truth nevertheless I’ll certainly come back once more. Hiya, I am really glad I’ve found this information. Today bloggers publish only about gossip and internet stuff and this is actually frustrating. A good website with interesting content, that is what I need. Thanks for making this site, and I will be visiting again. Do you do newsletters by email? Hey there. I discovered your web site by means of Google while looking for a comparable matter, your web site came up. It appears great. I have bookmarked it in my google bookmarks to visit then. Hiya, I’m really glad I have found this information. Today bloggers publish only about gossip and internet stuff and this is really irritating. A good website with exciting content, that’s what I need. Thank you for making this site, and I will be visiting again. Do you do newsletters by email? Hey there. I found your blog via Google even as searching for a similar matter, your website got here up. It seems great. I have bookmarked it in my google bookmarks to visit then. Nearly all of whatever you mention is supprisingly accurate and that makes me ponder the reason why I had not looked at this with this light previously. This particular piece really did switch the light on for me as far as this particular issue goes. But at this time there is one point I am not too comfortable with and whilst I try to reconcile that with the actual main idea of your position, permit me see just what all the rest of your visitors have to point out.Well done. Hey there. I discovered your website via Google at the same time as searching for a comparable subject, your website got here up. It appears great. I’ve bookmarked it in my google bookmarks to visit then. Hi there. I discovered your site by way of Google at the same time as searching for a related matter, your web site came up. It seems great. I’ve bookmarked it in my google bookmarks to visit then. Hi there. I found your blog via Google while searching for a related subject, your site got here up. It appears good. I’ve bookmarked it in my google bookmarks to visit then. Hey there. I found your blog by way of Google while searching for a related topic, your site came up. It looks good. I’ve bookmarked it in my google bookmarks to come back then. Thank you, I’ve just been fpowfjiosd looking for information about this subject for ages and yours is the best I have discovered till now. But, what about the bottom line? Are you sure about the source? Quite compelling elements you have said, thank you for writing. Quite motivating information you have remarked, thanks for putting up. I would like to thank you for the efforts you’ve put in writing this web site. I’m hoping the same high-grade website post from you in the upcoming also. In fact your creative writing skills has encouraged me to get my own site now. Really the blogging is spreading its wings fast. Your write up is a good example of it. Just wanna input on few common points, The web site layout is perfect, the articles is really superb : D.
Hiya, I am really glad I’ve found this info. Nowadays bloggers publish only about gossip and net stuff and this is really frustrating. A good blog with interesting content, that is what I need. Thank you for making this web-site, and I’ll be visiting again. Do you do newsletters by email? Hiya, I’m really glad I’ve found this info. Today bloggers publish only about gossip and web stuff and this is really irritating. A good website with interesting content, this is what I need. Thank you for making this web-site, and I will be visiting again. Do you do newsletters by email? Hey there. I found your blog by the use of Google even as looking for a related matter, your site came up. It appears to be great. I have bookmarked it in my google bookmarks to visit then. Hey there. I found your web site by the use of Google even as looking for a similar topic, your website came up. It looks great. I’ve bookmarked it in my google bookmarks to come back then. We are a group of volunteers and opening a new scheme in our community. Your web site provided us with valuable details to function on. You’ve done an impressive job and our complete community will be grateful to you. Hello there. I discovered your web site by means of Google while looking for a similar topic, your site came up. It appears great. I’ve bookmarked it in my google bookmarks to come back then. Hiya, I’m really glad I’ve found this info. Today bloggers publish just about gossip and web stuff and this is really irritating. A good website with interesting content, this is what I need. Thanks for making this web site, and I’ll be visiting again. Do you do newsletters by email? Tremendously insightful information you’ll have stated, a big heads up for publishing. Genuinely helpful resources that you have remarked, warm regards for posting. Hi my family member! I wish to say that this article is awesome, great written and include almost all vital infos. I would like to peer extra posts like this. Hi, you used to write outstanding articles, but the last several posts have been kinda boring… I miss your super writing. Past several posts are just slightly out of track! Very absorbing details that you have remarked, thanks a lot for setting up. Remarkably helpful highlights you’ll have mentioned, warm regards for writing. I appreciate your data in this article. Itâ€™s smart, well-written and straightforward to recognize. You’ve my attention on this topic. I will likely be back. Just like the old saying goes, within the proâ€™s head you’ll find few options, nonetheless , for a person with the beginnerâ€™s brain, the world is open up. Hiya, I am really glad I have found this information. Nowadays bloggers publish just about gossip and net stuff and this is actually irritating. A good web site with interesting content, that is what I need. Thank you for making this web-site, and I’ll be visiting again. Do you do newsletters by email? Hey there. I discovered your site by way of Google even as searching for a comparable subject, your web site got here up. It appears great. I’ve bookmarked it in my google bookmarks to come back then. Hello there. I found your website via Google while searching for a similar matter, your site got here up. It seems to be great. I’ve bookmarked it in my google bookmarks to come back then. Hello there. I found your site by the use of Google even as searching for a comparable subject, your site got here up. It appears good. I’ve bookmarked it in my google bookmarks to come back then. Remarkably intriguing elements you’ll have said, thanks a lot for adding. Really insightful knowledge you have said, many thanks for submitting. Whats up very cool blog!! Guy .. Excellent .. Superb .. I will bookmark your blog and take the feeds also…I am glad to search out a lot of useful information right here within the put up, we want develop more strategies on this regard, thanks for sharing. Seriously motivating data you have remarked, thanks for publishing. Thank you much for providing people with an exceptionally pleasant opportunity check tips using this site. It really is so excellent and also rich in fun for me personally as well as my office consorts to visit your site at the most 3 times in a few days to study the fresh advice you will have. Not to mention, On the web just usually satisfied for the magnificent feelings served by you actually. Certain two concepts on this page are quickly the most beneficial we have all ever endured. Hiya, I am really glad I have found this info. Today bloggers publish only about gossip and web stuff and this is really annoying. A good site with interesting content, that’s what I need. Thank you for making this website, and I will be visiting again. Do you do newsletters by email? Hey there. I discovered your blog by way of Google while looking for a similar matter, your web site came up. It appears to be good. I have bookmarked it in my google bookmarks to come back then. Hello there. I discovered your blog by way of Google at the same time as looking for a comparable matter, your site came up. It appears good. I have bookmarked it in my google bookmarks to come back then. Very interesting points you have noted , thankyou for putting up. “Above all be true to yourself, and if you can not put your heart in it, take yourself out of it.” by Hardy D. Jackson. Really beneficial details that you have stated, thank you for writing. Absolutely interesting data that you have said, a big heads up for putting up. Hello there. I discovered your blog by means of Google at the same time as searching for a similar topic, your website came up. It seems good. I’ve bookmarked it in my google bookmarks to come back then. Hey there. I discovered your site via Google whilst searching for a comparable matter, your site came up. It seems to be great. I have bookmarked it in my google bookmarks to come back then. Admiring the time and energy you put into your blog and in depth data you offer. It’s excellent to come across a blog every once in a even though that isn’t the same old rehashed material. Great read! I’ve bookmarked your site and I’m adding your RSS feeds to my Google account. Hey there. I found your site via Google at the same time as searching for a comparable matter, your website came up. It appears to be great. I have bookmarked it in my google bookmarks to come back then. I used to be very happy to find this web-site.I wanted to thanks on your time for this wonderful read!! I undoubtedly enjoying each little little bit of it and I’ve you bookmarked to take a look at new stuff you weblog post. While I merely hope to inform you that I am certain inexperienced to putting up a blog and absolutely liked your webpage. Very possible I am prone to bookmark your article post . You indeed have amazing article topic. Admire it for discussing with our company your domain article. Thank you a lot for sharing this with all of us you really recognize what you are talking approximately! Bookmarked. Kindly also discuss with my website =). We will have a hyperlink change arrangement among us! Genuinely motivating resources that you have stated, thank you for submitting. Definitely motivating details that you have stated, warm regards for submitting. I ran across your internet site last week and started to follow your posts consistently. I havenâ€™t commented on any kind of weblog internet site just however but I was considering to start soon. Itâ€™s truly exciting to actually contribute to an write-up even if itâ€™s only a blog. I actually donâ€™t know exactly what to write other than I genuinely loved reading by way of a couple of of your articles. Fantastic articles for sure. I will maintain visiting your blog regularly. I learned a good deal from you. Thanks! Hello there. I discovered your website by means of Google even as searching for a similar subject, your site came up. It appears good. I have bookmarked it in my google bookmarks to come back then. Normally I don’t learn post on blogs, nevertheless I would like to say that this write-up extremely forced me to take a appear at and do so! Your writing style has been surprised me. Thank you, quite fantastic article. Some genuinely interesting data, properly written and broadly user pleasant. Hello there. I found your web site by way of Google while looking for a similar subject, your web site came up. It seems good. I have bookmarked it in my google bookmarks to visit then. Normally I don’t read article on blogs, however I wish to say that this write-up very compelled me to check out and do it! Your writing taste has been amazed me. Thanks, very great article. Hello there. I found your website by way of Google whilst searching for a related matter, your site got here up. It seems to be great. I’ve bookmarked it in my google bookmarks to visit then. Hiya, I am really glad I have found this information. Nowadays bloggers publish only about gossip and internet stuff and this is actually irritating. A good web site with exciting content, that’s what I need. Thanks for making this web-site, and I will be visiting again. Do you do newsletters by email? Hiya, I’m really glad I have found this information. Nowadays bloggers publish just about gossip and net stuff and this is really irritating. A good site with exciting content, this is what I need. Thank you for making this site, and I’ll be visiting again. Do you do newsletters by email? Hiya, I am really glad I’ve found this information. Today bloggers publish only about gossip and internet stuff and this is really annoying. A good website with exciting content, that’s what I need. Thanks for making this web-site, and I will be visiting again. Do you do newsletters by email? Noticeably absorbing data you have mentioned, warm regards for writing. Very engaging suggestions that you have mentioned, thanks so much for writing. I’m very pleased to discover this web site. I wanted to thank you for ones time for this wonderful read!! I definitely loved every little bit of it and i also have you book-marked to check out new stuff on your web site. It’s the very best time to make some plans for the future and it truly is time to be pleased. I’ve read this post and if I could I wish to suggest you some fascinating items or advice. Perhaps it is possible to write next articles referring to this article. I wish to read even a lot more items about it! magnificent llofksis submit, very informative. I’m wondering why the other experts of this sector do not realize this. You must continue your writing. I’m confident, you have a great readers’ base already! Remarkably absorbing specifics you have stated, thanks so much for publishing. Hi there. I found your site by way of Google whilst searching for a similar subject, your website came up. It seems great. I have bookmarked it in my google bookmarks to visit then. Hello there. I found your web site by the use of Google while looking for a related matter, your web site came up. It appears good. I have bookmarked it in my google bookmarks to visit then. Hi there. I discovered your web site by the use of Google even as looking for a related subject, your website came up. It seems good. I’ve bookmarked it in my google bookmarks to visit then. Tremendously motivating information that you have said, thanks so much for publishing. Quite helpful elements that you have mentioned, thanks so much for adding. I was more than happy to uncover this site. I want to to thank you for your time just for this fantastic read!! I definitely enjoyed every part of it and I have you saved as a favorite to see new information in your website. Hiya, I’m really glad I have found this info. Nowadays bloggers publish just about gossip and net stuff and this is actually frustrating. A good website with exciting content, this is what I need. Thank you for making this web-site, and I will be visiting again. Do you do newsletters by email? Hi there. I discovered your web site by way of Google whilst searching for a related topic, your web site came up. It appears great. I’ve bookmarked it in my google bookmarks to visit then. Hi there, just became alert to your weblog via Google, and identified that it’s really informative. I am going to watch out for brussels. I’ll be grateful in the event you continue this in future. Lots of individuals is going to be benefited from your writing. Cheers! It is truly a great and useful piece of information. I’m happy that you simply shared this useful information with us. Please keep us informed like this. Thanks for sharing. Fairly intriguing suggestions that you have mentioned, warm regards for writing. Seriously useful data that you have stated, many thanks for posting. Extraordinarily entertaining resources you’ll have said, thanks a lot for submitting. I’m extremely pleased to discover this great site. I want to to thank you for your time for this fantastic read!! I definitely loved every little bit of it and I have you saved as a favorite to look at new stuff in your blog. Thanks for the unique tips shared on this blog. I have noticed that many insurers offer shoppers generous discount rates if they opt to insure a few cars together. A significant volume of households include several motor vehicles these days, particularly people with more mature teenage children still residing at home, as well as savings in policies can easily soon begin. So it pays off to look for a bargain. Hiya, I’m really glad I have found this info. Nowadays bloggers publish just about gossip and internet stuff and this is actually irritating. A good web site with exciting content, that’s what I need. Thanks for making this web site, and I’ll be visiting again. Do you do newsletters by email? Hey there. I discovered your web site by means of Google while searching for a comparable topic, your website got here up. It appears great. I’ve bookmarked it in my google bookmarks to come back then. Hey there. I discovered your blog by way of Google at the same time as looking for a comparable subject, your site got here up. It seems good. I’ve bookmarked it in my google bookmarks to come back then. Hey there. I discovered your web site by the use of Google even as searching for a similar matter, your site came up. It appears good. I’ve bookmarked it in my google bookmarks to visit then. Hey there. I discovered your site by way of Google whilst searching for a comparable subject, your website came up. It seems to be great. I have bookmarked it in my google bookmarks to visit then. Hello there. I discovered your website by the use of Google even as searching for a related matter, your web site got here up. It appears good. I have bookmarked it in my google bookmarks to visit then. I have to show some thanks to the writer just for bailing me out of such a dilemma. As a result of surfing throughout the online world and coming across strategies that were not beneficial, I believed my entire life was nicely over. Existing minus the solutions to the difficulties you have resolved all by means of the post is a serious case, and the kind that would have negatively damaged my career if I had not discovered your web page. Your personal personal know-how and kindness in playing with every part was tremendous. Iâ€™m not confident what I would have done if I hadnâ€™t come upon such a stuff like this. I can also at this moment appear ahead to my future. Thanks very considerably for your specialized and results-oriented assist. I wonâ€™t be reluctant to suggest your internet site to anybody who needs guide on this subject matter. Noticeably insightful highlights you have remarked, many thanks for writing. Admiring the time and effort you put into your site and in depth information you provide. It’s great to come across a blog every once in a while that isn’t the same old rehashed material. Great read! I’ve saved your site and I’m adding your RSS feeds to my Google account. Hello there. I discovered your website by the use of Google at the same time as looking for a related matter, your site got here up. It looks great. I have bookmarked it in my google bookmarks to visit then. Decide on some well-informed followers and get immediate feedback. You’ll find a variety of ways to print the feeds. Hiya, I’m really glad I’ve found this info. Today bloggers publish just about gossip and web stuff and this is really frustrating. A good site with exciting content, that’s what I need. Thank you for making this site, and I’ll be visiting again. Do you do newsletters by email? That you are my inhalation , I own couple of blogs and rarely run out from to post : (. It happens to be right time to have some goals for the near future. I have read through this article and if I could, I want to encourage you couple of great proposal. Heya iâ€™m for the very first time here. I identified this board and I discover It truly valuable & it helped me out considerably. I hope to present one thing again and support others like you aided me. Surprisingly entertaining advice you’ll have said, thanks for publishing. Incredibly helpful elements you’ll have mentioned, thanks so much for putting up. Right after research a couple of of the weblog posts inside your web site now, and I genuinely like your method of blogging. I bookmarked it to my bookmark website record and will probably be checking back soon. Pls have a look at my site as effectively and let me know what you believe. Fairly alluring resources you’ll have stated, thanks for posting. Hi there! Nice stuff, please do tell me when you lastly post something like this! I like this blog very much, Its a very nice berth to read and receive info . “One man’s religion is another man’s belly laugh.” by Robert Anson Heinlein. Hey there. I discovered your web site via Google while looking for a related matter, your site got here up. It seems to be good. I have bookmarked it in my google bookmarks to come back then. Hiya, I’m really glad I have found this info. Nowadays bloggers publish only about gossip and net stuff and this is actually frustrating. A good site with exciting content, that’s what I need. Thanks for making this web site, and I’ll be visiting again. Do you do newsletters by email? Hey there. I discovered your website by means of Google at the same time as searching for a similar subject, your web site came up. It seems to be great. I’ve bookmarked it in my google bookmarks to visit then. Hello there. I discovered your site by means of Google whilst looking for a comparable topic, your site came up. It appears to be good. I’ve bookmarked it in my google bookmarks to visit then. It really is proper day to have some desires for the long-run. I’ve read through this write-up and if I could, I desire to suggest you number of helpful tip. Surprisingly entertaining suggestions you’ll have stated, many thanks for writing. Highly helpful information that you have said, many thanks for publishing. Hello there. I discovered your blog by the use of Google even as looking for a related topic, your site came up. It appears good. I have bookmarked it in my google bookmarks to visit then. Nice post. I learn some thing a lot more challenging on unique blogs everyday. It’s going to always be stimulating to read content material from other writers and practice slightly something from their store. I’d prefer to utilize some using the content material on my blog whether you don’t mind. Natually I’ll offer you a link in your internet blog. Remarkably informative elements you have mentioned, thank you for setting up. Hiya, I am really glad I have found this information. Today bloggers publish just about gossip and internet stuff and this is really irritating. A good website with interesting content, that’s what I need. Thank you for making this website, and I’ll be visiting again. Do you do newsletters by email? Hi there. I discovered your web site by way of Google whilst looking for a comparable subject, your site got here up. It seems great. I have bookmarked it in my google bookmarks to visit then. It happens to be ideal opportunity to generate some intentions for the long run. I have browsed this article and if I may possibly, I wish to suggest you number of remarkable tip. I do not even know the way I ended up in this article, but I thought this kind of submit used to be fantastic. I do not realize who you might be and surely you are going to a well-known blogger should you aren’t by now: ) Cheers! Exceedingly informative elements that you have stated, thanks so much for adding. Genuinely enjoyable highlights that you have remarked, thank you for putting up. I will right away grasp your rss feed as I can not in finding your e-mail subscription link or e-newsletter service. Do you’ve any? Please allow me recognise in order that I may just subscribe. Thanks. Surprisingly enlightening resources that you have said, say thanks a lot for submitting. It really is appropriate occasion to make some intentions for the extended term. I have study this article and if I could, I want to suggest to you you couple useful instruction. Pretty section of content keynes. I just stumbled upon your weblog and in accession capital to assert that I get actually enjoyed account your blog posts. Any way I will be subscribing to your feeds and even I achievement you access consistently quickly. I do believe all of the concepts you’ve offered on your post. They are really convincing and can definitely work. Nonetheless, the posts are too short for beginners. May you please lengthen them a bit from next time? Thanks for the post. Hi there. I discovered your web site by means of Google while searching for a similar topic, your website came up. It appears great. I have bookmarked it in my google bookmarks to come back then. Hiya, I’m really glad I’ve found this information. Today bloggers publish only about gossip and net stuff and this is really annoying. A good site with interesting content, that is what I need. Thanks for making this website, and I will be visiting again. Do you do newsletters by email? Hiya, I am really glad I’ve found this info. Today bloggers publish only about gossip and net stuff and this is actually frustrating. A good site with exciting content, that’s what I need. Thank you for making this site, and I’ll be visiting again. Do you do newsletters by email? Thank you that is quite beneficial for me, as a new website has been inundated with comments that seem OK at first glance but then get repeated with a slight change of wording. I’ve something concrete to go on now and will delete quite plenty of them. Emeryeps is a Portland Oregon SEO Corporation started by Michael Jemery. The cause of Emeryeps.com is to extend SEO services and help Portland merchants with their Search Engine Optimization to assist them climb the ranks of Google and yahoo. Thank you, I’ve just been searching for information about this subject for a while and yours is the greatest I’ve came upon so far. However, what in regards to the conclusion? Are you sure about the supply? Hey there. I discovered your web site by means of Google while looking for a comparable topic, your website got here up. It seems good. I’ve bookmarked it in my google bookmarks to visit then. Hiya, I’m really glad I’ve found this information. Nowadays bloggers publish only about gossip and net stuff and this is really frustrating. A good blog with exciting content, that is what I need. Thank you for making this site, and I’ll be visiting again. Do you do newsletters by email? Hiya, I’m really glad I have found this information. Nowadays bloggers publish only about gossip and web stuff and this is actually annoying. A good site with exciting content, that is what I need. Thank you for making this web-site, and I’ll be visiting again. Do you do newsletters by email? Do you mind if I quote a couple of your posts as long as I provide credit and sources back to your site? My blog is in the very same area of interest as yours and my visitors would definitely benefit from some of the information you provide here. Please let me know if this alright with you. Appreciate it! Somebody essentially assist to make significantly posts I might state. That is the very first time I frequented your website page and up to now? I surprised with the analysis you made to make this actual post incredible. Magnificent activity! Hello there. I discovered your blog by way of Google while searching for a similar topic, your website got here up. It looks good. I have bookmarked it in my google bookmarks to come back then. Hiya, I’m really glad I’ve found this info. Nowadays bloggers publish just about gossip and web stuff and this is really annoying. A good site with interesting content, this is what I need. Thank you for making this site, and I’ll be visiting again. Do you do newsletters by email? Casinoonline-uk is a gambling casino review website for Reviews, no deposit bonus, casino bonus codes & free spins. You will be able to obtain results of casino, free casino contests and current news reports at Casinoonline-uk.net. Hi there. I discovered your site via Google at the same time as searching for a comparable matter, your web site came up. It seems to be good. I’ve bookmarked it in my google bookmarks to come back then. Hiya, I am really glad I’ve found this info. Nowadays bloggers publish only about gossip and internet stuff and this is really annoying. A good blog with interesting content, that’s what I need. Thank you for making this website, and I’ll be visiting again. Do you do newsletters by email? naturally like your web site however you need to take a look at the spelling on several of your posts. Several of them are rife with spelling problems and I find it very bothersome to inform the reality then again I’ll certainly come again again. Hey there. I discovered your website by the use of Google while looking for a similar topic, your web site came up. It looks good. I’ve bookmarked it in my google bookmarks to visit then. We are a group of volunteers and opening a new scheme in our community. Your web site given us with valuable data to function on. Youâ€™ve done an impressive job and our entire community is going to be grateful to you. Thanks for your whole function on this website. My mom take interest in doing research and it is truly effortless to comprehend why. Most of us know all about the lively form you deliver rewarding strategies on your website and even improve response from other individuals about this point then our own simple princess is actually learning a fantastic deal. Take pleasure in the remaining portion of the year. Your carrying out a genuinely great job. Tremendously compelling data you’ll have remarked, warm regards for writing. That is really a genuinely incredible powerful resource that you are offering and you just supply it away cost-free!! I that can compare with discovering websites which comprehend the certain valuation on providing you with fantastic learning resource for zero cost. We truly dearly loved examining this web web site. Have enjoyable here! I really enjoy studying on this website , it contains great posts . “Violence commands both literature and life, and violence is always crude and distorted.” by Ellen Glasgow. Hi you’ll find using WordPress for your website platform? I’m new towards the weblog world but I’m trying to get started and set up my own. Do you call for any html coding expertise to make your own blog? Any support would be greatly appreciated! Hiya, I am really glad I’ve found this information. Nowadays bloggers publish just about gossip and net stuff and this is actually frustrating. A good web site with interesting content, that is what I need. Thanks for making this website, and I’ll be visiting again. Do you do newsletters by email? Hey there. I found your website by the use of Google while searching for a similar matter, your site got here up. It seems good. I’ve bookmarked it in my google bookmarks to visit then. Hello there. I discovered your blog via Google at the same time as searching for a similar subject, your web site got here up. It appears to be good. I have bookmarked it in my google bookmarks to visit then. I consider something truly intriguing about your site so I saved to fav. SEOScientist is a Buy PBN Links Online Business. The purpose of Market.Source-wave.com is to provide Buy PBN Links services and help enterprises with their Search Engine Optimization to help them ascend the position of Google. Heya here, just started to be alert to your article through Google, and have found that it’s really entertaining. I’ll take pleasure in if you decide to continue such. Good morning there, just turned out to be mindful of your weblog through Search engine, and discovered that it’s very helpful. I’ll value should you continue such. Hiya, I am really glad I’ve found this information. Nowadays bloggers publish just about gossip and internet stuff and this is really frustrating. A good site with interesting content, that is what I need. Thank you for making this web-site, and I’ll be visiting again. Do you do newsletters by email? Howdy here, just got familiar with your blog through Search engine, and discovered that it’s truly entertaining. I’ll appreciate if you decide to continue on this approach. Hiya, I’m really glad I’ve found this information. Nowadays bloggers publish just about gossip and web stuff and this is really irritating. A good web site with exciting content, that is what I need. Thank you for making this web-site, and I’ll be visiting again. Do you do newsletters by email? Wow! This could be one specific of the most useful blogs Weâ€™ve ever arrive across on this subject. Basically Magnificent. I am also an expert in this topic so I can understand your effort. Great web site. Lots of helpful info here. I’m sending it to several pals ans additionally sharing in delicious. And obviously, thank you to your sweat! Hiya, I’m really glad I’ve found this info. Today bloggers publish just about gossip and internet stuff and this is really frustrating. A good site with exciting content, this is what I need. Thanks for making this web site, and I will be visiting again. Do you do newsletters by email? Hiya, I am really glad I’ve found this information. Nowadays bloggers publish only about gossip and net stuff and this is really frustrating. A good website with exciting content, this is what I need. Thanks for making this web site, and I will be visiting again. Do you do newsletters by email? Hi there. I found your website via Google while looking for a related topic, your web site came up. It looks good. I’ve bookmarked it in my google bookmarks to come back then.